Influential French filmmaker Agnès Varda, whose innovative, unconventional films La Pointe Courte, Cleo from 5 to 7, and Le Bonheur helped define France’s New Wave cinema, has been named the recipient of the Writers Guild of America West’s 2019 Jean Renoir Award for International Screenwriting Achievement, which recognizes an international writer who has advanced the literature of motion pictures and made outstanding contributions to the profession of screenwriter. Varda will be honored at the WGAW’s 2019 Writers Guild Awards L.A. show on Sunday, February 17. 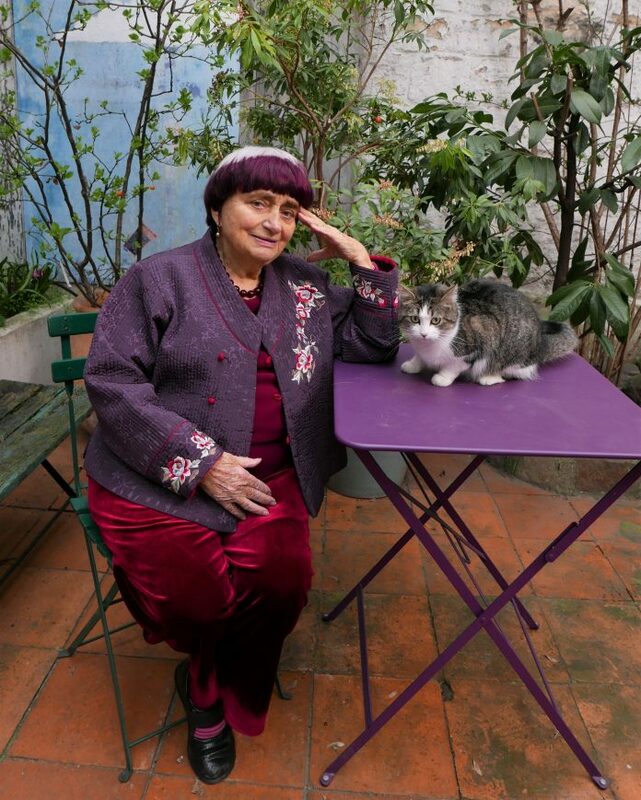 “The Jean Renoir Award was made for Agnès Varda. She is one of our industry’s pioneers, a revolutionary artist who paved the roads of filmmaking. Her films are relentlessly curious, complex and challenging, and her body of work continues to influence modern filmmakers and resonate with modern audiences. The Board of Directors is thrilled to give her this honor,” said WGAW President David A. Goodman. Varda’s prolific, groundbreaking body of work has been defined by a documentary realism, a feminist sensibility, and a focus on social commentary, all charged by her own signature experimental style, including her then-innovative use of on-location shooting, non-professional actors, and other techniques. Born in 1928 in Belgium, Varda changed her named from Arlette to Agnès at age 18. She initially studied art history before making the transition to photography. After embarking on a career as a photographer, shooting typical subjects such as families and weddings, she soon emerged as one of the leading voices of Left Bank cinema and the French New Wave, or Nouvelle Vague, while maintaining a life-long, symbiotic interrelationship between photo and cinematic forms. As she once remarked, “I take photographs or I make films, or I put the films in the photos, or photos in the films,” as one medium informed the other and vice versa. After Jean Vilar hired her as the official photographer of France’s Théâtre National Populaire, where she worked for a decade from 1951-61, she traveled throughout Europe earning a reputation as an in-demand photo-journalist with a sharp eye. In fact, her early photography would inspire her subsequent narrative films and documentaries she wrote and directed, beginning with her seminal debut, 1955’s La Pointe Courte. Without filmmaking experience or even attending film school, Varda prepped her creative vision by photographing every element that she intended to film, carefully framed photos which served as models for shots in the film in terms of content and composition, tone and meaning. Describing her filmmaking style as cinécriture (i.e., cinematic writing or writing on film), Varda wielded her camera like a pen, as her newly created term merged “cinema” and “writing” in French. While the French New Wave was divided into two subgroups – the Cahiers du Cinema and Left Bank cinema – due to her literary influences and because her work predates the movement, Varda’s films belong to Rive Gauche (Left Bank) cinema, viewed as the more experimental of the two schools. Varda and other Left Bank filmmakers developed a style of filmmaking that integrated documentary techniques with the avant-garde, often collaborating with each other. After La Pointe Courte, she shot a series of documentary shorts before following-up with her next feature film, 1962’s Cleo from 5 to 7, once again employing a mix of documentary and narrative techniques, this time tracking a popular singer during two real-time hours as she waits for the results of a recent biopsy. Rejecting the typical objectification of women seen in most movies of the era, Varda imbues Cleo with her own singular vision, unable to be constructed through the gaze of others around her. This challenging film was followed by 1965’s slightly more traditionally structured drama Le Bonheur, which lyrically depicts ordinary life as simultaneously mundane and poetic, and subsequently 1966’s The Creatures. While living and working in Paris, Varda met her husband, French director-screenwriter Jacques Demy, known for his own sumptuous musicals The Umbrellas of Cherbourg and The Young Girls of Rochefort. The couple married in 1960 and remained together until Demy’s untimely death in 1990 at age 59. Varda has been considered a feminist filmmaker due to her frequent inclusion of female protagonists, as well as her development of a distinct female cinematic voice – as French film critic Delphine Benezet calls Varda “au feminin singulier,” a woman of singularity and of the utmost importance in film history, all the while embracing her own femininity on her own terms. In 1975 she founded her own production company, Cine-Tamaris. In 1984, Varda delivered one of her mid-career masterpieces, the bleak, uncompromising Vagabond, a docu-style drama exploring the mysterious, if inevitable death of a young female drifter. Employing non-linear techniques, interviews and flashbacks, the film is divided into 47 episodes, each told from a different person’s point of view, and earned her the Venice Film Festival’s Golden Lion. Shortly after her husband’s death, Varda created the film Jacquot de Nantes (1991), a loving tribute to her late husband which recreates his early life – a portrait of the artist as a young man, if you will – incorporating documentary elements by including poignant footage of the real-life dying Demy. In 1995, she also created another tribute to her late husband, The World of Jacques Demy. Notable for its decidedly fragmentary, free-form approach, 2000’s The Gleaners and I is a documentary chronicling all types of “gleaners,” whether harvesters who live in the French countryside or artists who scour the dumpsters in Paris to create art utilizing recycled materials. In 2009, Varda created her own kind of cinematic memoir with the acclaimed documentary feature, The Beaches Agnès, which explores her colorful past via memories, photographs, film clips, reenactments, home movies, contemporary interviews, and her own commentary as she narrates the story of her life, or at least how she remembers it. The masterful, layered film earned her a Cesar Award, France’s national film award. Most recently, Varda co-directed the acclaimed documentary, Faces Places (2017), with artist JR, traveling through rural France and creating portraits of those people they come across along the way. The film earned the pair a 2018 Oscar nomination for Best Documentary Feature, making Varda the oldest person ever to be nominated for a competitive Oscar (only a few days older than fellow Oscar nominee, Call Me By Your Name screenwriter James Ivory), as well as garnered France’s Lumiere Award. Beyond her numerous, acclaimed documentary short films she continued to create throughout her career, Varda’s additional notable films include 1976’s Daguerréotypes, featuring portraits of locals who occupy the small shops along Paris’ Rue Daguerre, where the filmmaker lived for many years, 1977’s One Sings, the Other Doesn’t, involving the intertwined lives of two women in 1970’s France set against the progress of the women’s movement, a key personal interest to Varda, 1981’s Documenteur, 1988’s Le petit amour (starring Jane Birkin, Varda’s son Mathieu Demy, and Charlotte Gainsbourg) and its thematic companion piece, Jane B. for Agnès B., an “imagined biopic” of singer-actress and fashion icon Birkin, 1995’s cinema-centric comedy One Hundred and One Nights, and 2004’s Cinevardaphoto, a triptych of short films exploring the power and vitality of the photograph. On the small screen, 2011’s Agnès Varda: From Here to There is an absorbing, five-part doc miniseries which chronicles the filmmaker’s travels around the world, meeting friends, artists, and filmmakers along the way to create an expansive view of the global contemporary art scene. Even at age 90, Varda is not yet done creating: her upcoming documentary film, Varda to Agnès, selected to premiere at the Berlinale Festival and due out later in 2019, explores her experience as writer-director, illuminating personal insight into her form of “cine-writing,” as she travels from Paris to Los Angeles to Beijing. In spite of her rather unorthodox style, or more likely because of it, Varda has earned numerous accolades over the course of her decades-long career: In 2001, she received an honorary César Award. In 2002, she received the French Academy’s René Clair Award. In 2007, she was appointed a Grand Officer of the National Order of Merit of France – and later promoted to Grand Cross in 2013. In 2009, she was made Commandeur de la Légion d’honneur – and was promoted to Grand Officer in 2017. In 2013, she received a FIFA Award for her work in film preservation and restoration. In 2014, she received the European Film Academy’s Lifetime Achievement Award – and in 2015, she was the first woman to receive an honorary Palme d’or (Golden Palm), the highest prize awarded at the Cannes Film Festival. In 2017, Varda received an Academy Honorary Award for her contributions to cinema, making her the first female filmmaker to receive AMPAS’ special award. In 2003, Varda launched her third career as a visual artist. Her installations have been shown at the Venice Art Biennale and Lyon Biennale of Contemporary Art, SMAK in Ghent, Art 41 Basel, the Fondation Cartier pour l’Art Contemporain, Paul Valéry Museum in Sète, CAFA in Beijing, and Nathalie Obadia Gallery in Paris. In 2013, LACMA hosted Varda’s first U.S. art exhibition, entitled Agnès Varda in Californialand, featuring sculptural installations, photos, and short films, all inspired by the time she spent in Los Angeles during the ’60s, as well as the Blum & Poe gallery in 2017 in New York. Varda has two children: a daughter, Rosalie Varda-Demy, who manages the family company and produced Faces Places, and a son, actor-writer-director Mathieu Demy (Americano), who has appeared in several of his mother’s films. Named after the influential French filmmaker, the WGAW’s Jean Renoir Award for Screenwriting Achievement honors international screenwriters working outside the U.S. and in other languages. Previous Jean Renoir Award honorees include Italian screenwriters Suso D’Amico (2009) and Tonino Guerra (2011), Japanese filmmakers Akira Kurosawa, Shinobu Hashimoto, Ryûzô Kikushima, and Hideo Oguni (2013), Spanish filmmaker Pedro Almodóvar (2015), and Iranian filmmaker Abbas Kiarostami (2017).